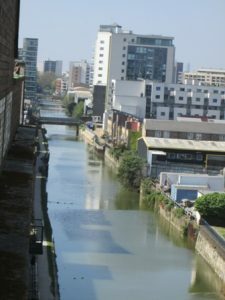 The Limehouse Cut was the first navigable canal to be dug in London and was one of the earliest canals in England. It opened nearly 250 years ago in 1770. At that time most of the area was rural in character. Today the towpath provides a pleasant and interesting green walk throgh a more urban setting between Limehouse Basin in the west and the River Lea to the east. The towpath passes under roads and railways providing an unusual viewpoint of an area which is full of history. In the 18th and 19th century the canals were the freight arteries of the country and are still lined with industrial buildings from this period. 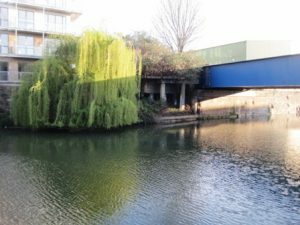 The walk is about 2.5 kilometres in length to the Lea Navigation at Bow Locks and 3 kilometres in length to Three Mills. 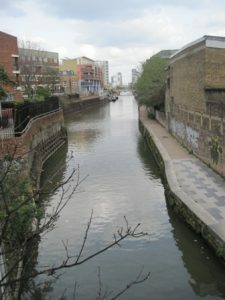 The Limehouse Cut was dug as a short cut between River Lea at Bromley in the east to the River Thames at Limehouse in the west. It was authorised under the River Lea Act 1767 and took 16 months to dig. At the northeast end of the canal was Bromley Lock and at the southwest end Limehouse Lock. Before the canal was dug, barges on the River Lea bringing grain and malt from Hertfordshire to London would wait for the outgoing tide to sweep them around the many convoluted loops of Bow Creek to the River Thames. They would then wait for the incoming tide to take them up the Thames around the horseshoe shape of the Isle of Dogs and towards London. 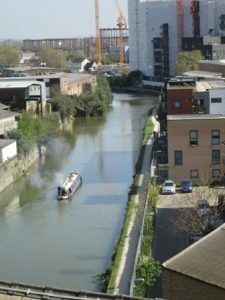 The Limehouse Cut reduced this protracted tidal journey of about 12 kilometres to a straight line route of less than 3 kilometres. The Limehouse Cut was originally only wide enough for a Lea Barge of 13 foot beam but became so popular that in 1772, two years after the canal opened, a passing place had to be added to allow barges to get by each other as the canal was only wide enough for one barge at a time. However this was not enough for the demand and by 1777 the whole of the canal had been widened so that barges could pass each other at any point. 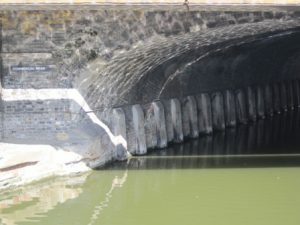 By 1807 most of the canal had been widened to about 55ft. Most of the canal still passed through fields. Industry along the canal included several pot ash works, a limekiln near Bow Common Bridge and several timber yards and other works at the Limehouse end of the canal. The opening by the Regent’s Canal company in 1820 of the Limehouse Basin and its ship lock just to the west of the Limehouse Cut’s Thames lock began to encourage further industrialisation at the Limehouse end of the Cut. The Limehouse Basin, which served the Regent’s Canal, specialised in the transhipment of coal from east coast colliers into canal barges. The coming of the railways and the further widening of the Limehouse Cut to 75ft also accelerated industrial development along its length until it was more or less fully lined with factories and warehouses on both sides. Its proximity to the East and West India Docks attracted port industries specialising in the processing of imported raw materials. The Limehouse Cut was also well connected to the canal network in north east London and conveniently placed for chemical works processing the by-products of gas works. Many of the historic buildings which lined the Limehouse Cut were destroyed by the bombing of the Second World War or by the redevelopment which followed it. In 1968 a new link between the Limehouse Cut and the Limehouse Basin was built and the connection to the Limehouse Lock was filled in. The canal is now a tranquil place to walk along with parts of the banks semi-wild and it is a home to wildlife including swans, ducks, geese, cormorants, moorhens and coots. Access along the towpath is excellent since a section of floating towpath has been installed to cover the section under the A12. Limehouse Cut no longer has any locks to call its own. 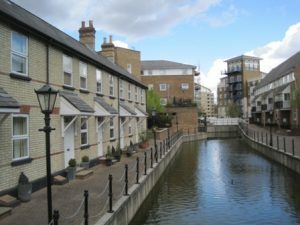 At its western end it is connected directly to the Limehouse Basin which has lock gates at its entrance from the River Thames and at the mouth of the Regent’s Canal. 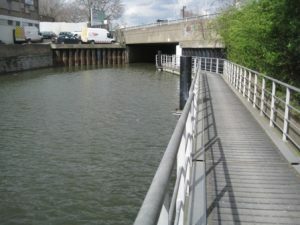 At the eastern end the Limehouse Cut connects directly to the Lee Navigation which is a canalised river with Bow Locks linking to the tidal Bow Creek. When it opened 1770 the Limehouse Cut had two sets of locks – Bromley Lock sealed the eastern end of the Limehouse Cut and Limehouse Lock the western end. 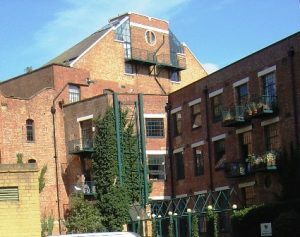 Many of the old working buildings on either side of the Limehouse Cut are still present interspersed with more modern houses and apartment blocks. You can start your walk at either the Thames Lock near the Limehouse Basin or from Three Mills in Bromley by Bow (where you can park in a supermarket car park). I will describe the walk starting from Limehouse. Find 48 Narrow Street. This Georgian building was formerly a pub which traded at the entrance to the Limehouse Cut until 1914. Cross the road and walk into Albert Mews opposite, this is the site of the old Limehouse Lock. The lock houses are on your left. Continue along Albert Mews and cross Northey Street. A few metres further on is Limehouse Basin. Turn right and walk a few metres parallel to the basin’s edge until you come to a canal entering the basin from the right which has a footbridge over it. This is the new part of the Limehouse Cut built in 1968 to connect the canal to the basin. Walk along the Limehouse Cut. After a little more than 50 metres the canal turns sharply to the left. After the turn you are on the old canal which originally carried straight on to the Limehouse Lock through the area where the new flats have been built behind you. Continue along the towpath and under the railway line. The arches of the railway were engineered by Robert Stephenson and G P Bidder in 1840 to form the second oldest urban railway viaduct in the world. It was built to carry the London and Blackwall Railway between the City and the Blackwall river ferry which provided a service to Gravesend. The carriages were originally rope hauled by stationary engines at either end of the line – steam was judged to be too much of a fire risk in view of the many timber yards and ropeworks the line would pass. However within 9 years the line had been converted to steam haulage. A 15 minute interval service was run and in the early 1850s some trains ran non-stop between Fenchurch Street and the Blackwall ferry covering the 3.5 mile journey in just 5 minutes. The line provided goods and passenger services until 1962 and the viaduct was unused for 25 years until passenger services returned on the Docklands Light Railway. On your right after passing under the railway you will see the tall clock tower of Hawksmoor’s St Anne’s Church. The church has the right to fly the White Ensign which is normally reserved for ships of the Royal Navy and the clock is a special maritime timepiece. To visit ascend the stairs at the Britannia Bridge in front of you and turn right into Newell Street, the church is a few metres along on your left. Commercial Road was built in the first decade of the 19th century to link London with the new West India Docks. Its construction precipitated the intensification of building of terraced housing in the still semi-rural ‘Stepney fields’ to its north over the next forty years for workers in the new docks and manufacturing enterprises. Commercial Road crosses the canal on the brick arch Britannia Bridge. Constructed between 1851 and 1853 this is the oldest bridge passing over the canal. The Britannia Lock was built at the same time with its main gates at either side of the bridge. The year after the lock was built the Regent’s Canal Company took control of the Limehouse Cut and built a connecting link into the Limehouse Basin. This connection was filled in again in 1864. The Britannia Lock gates were removed because, according to a report of 1893, they were “useless”. On the left just after the bridge the remains of a sluice gate can be seen. This vertical guillotine gate was added by British Waterways in 1948 but was removed in the 1990s. After Commercial Road the canal curves gently to the right to orientate itself for its straight stretch to Bow Locks. On your left you pass old council flats, Our Lady’s School and then the new flats of Copenhagen Place. In front of the new flats are moorings for houseboats. The canal soon passes under Burdett Road (maps show that Burdett Road was constructed somewhere between 1861 and 1868). Maps of the first half of the 19th century show a long “Cable Manufactory” running north of the canal where Burdett Road is now, and parallel to the canal to the right of the towpath was a ropewalk. Ropewalks were common in the days of sailing ships, they were long straight narrow pathways where long strands of material were laid before being twisted into ropes. The work was dangerous as the fine hemp fibres had a tendency to form a mist and explode. The standard length for a British Naval rope was 1,000 feet (305 metres) and a sailing ship required over 32 kilometres of rope. The “Cable Manufactory” and ropewalk shown on the old maps would both have been capable of making a British Naval Rope as they were both about 350 metres long. 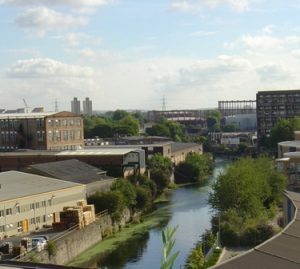 As you walk towards the next bridge (Bow Common Lane Bridge) you can see that the area on your right, where the ropewalk was, is now taken up with old warehouses. Further along is a more modern office development and recently constructed apartments. A short inlet halfway between Burdett Road and Bow Common Lane provides shelter for a handful of houseboats. To the left on the other side of the canal is the rear of the Thomas Road industrial estate. Bow Common Lane Bridge was constructed in 1929 and was known as “Stinkhouse Bridge”. On the north bank of the canal here were tar, varnish, fish manure, ammonia, pot ash, rubber and bone works and on the south side a tar and resin distillery and a felt works. On the far side of the bridge the areas on both sides of the canal are in the process of regeneration and consist of a mixture of old and new warehouses and modern housing. The housing is slowly replacing the industrial buildings. At the time of writing (October 2013), there is a collection of old military vehicles including armoured cars, tanks and missile launchers under a prefabricated roof on the north side of the canal close to Violet Road which crosses the Limehouse Cut on the next bridge that you come to. Facing the towpath on the south side of the canal immediately before a set of steps leading to the new build houses of Balladier Walk is a 1939 factory building which was built for the Cooperative Wholesale Society as a Joinery Works. The saw tooth roof pattern is an elegant solution to providing workers with sufficient natural light while preventing overheating – the north facing vertically orientated windows in the roof allow in daylight and air, but not direct sunlight. This design was widely used in industrial buildings of the mid 20th century but examples visible to the public are becoming rare. The Violet Road Bridge was opened in 1890. The decorated abutments are original but the steel box girder bridge carrying the road dates from 1971. Violet Road was constructed at the same time as the 1890 bridge and connected Bromley to Poplar via the existing Morris Road which is the road south of the bridge. On your right after the bridge is the former Spratt’s Patent Limited dog food factory which occupied 6 orange-red brick warehouses on the south bank of the canal. The site has an interesting history. In the 1860s it was used as market gardens. From 1873 to 1886 the Post Office directory records a Charles Sevin operating Palm Nut Oil Mills on the site. In 1887 nothing is recorded for the location, then in 1888 the entry reads: Dry Grain Co Ltd Sevin Charles, merchant. The site was subsequently taken over by Spratt’s and by the early 20th century this was the biggest dog food factory in the world. Barge loads of fish heads would be transported along the canal for processing into pet food. The factory also made ship’s biscuits and supplied biscuits to the troops in the Second Boer War (1899-1902). The warehouses were converted to live/work units in the 1980s and are now an extremely popular location for media based artists. On the other side of the canal from the Spratt’s factory is the new Caspian Wharf residential development. The wilderness area on the canal bank with its Willow trees and undergrowth is one of the rapidly diminishing natural habitat areas along the canal and is fiercely protected by residents of the Spratt’s development who successfully defended it during both the planning phase and the build of the Caspian Wharf development. The wilderness is connected to the green corridor of the railway and provides a potential breeding ground for wildlife using the railway line as a nocturnal foraging route. 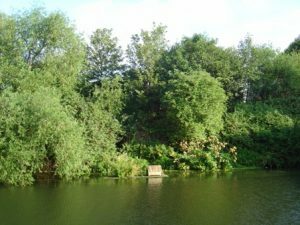 It is also a feeding place for herons and kingfishers and a home for coots, ducks and moorhens. When the wilderness area is not in full leaf you can see behind it a number of timbers and next to the railway bridge a dilapidated concrete structure. These are all that remains of an old wharf where barges were loaded with coal from railway sidings. The barges were pulled up the River Lea and the Regent’s Canal by horse to gasworks and later served coal fired power stations. The railway line which crosses the canal in front of you was the North London Railway which in the 19th Century transformed much of East London. It ran from Broad Street Station in the City through stations at Shoreditch, Haggerston, Dalston Junction, Hackney, Homerton, Victoria Park, OLd Ford, Bow and Poplar terminating at the West India Docks and Poplar Docks. The line next to the canal is now a part of the Docklands Light Railway, and further north a section is used by the London Overground line between Stratford and Richmond. Between the railway and the Spratt’s factory is a long strip of land used by the residents of the Spratt’s development as a garden. This was for many years the site of a rope factory. Beyond the railway bridge, maps of the 1860s show the area to the north of the canal – where the green and buff warehouses are now – given over to brick fields. To the south of the canal, market gardens covered the area as far south as the East India Docks and east to the River Lea. Brick fields were made by stripping the topsoil to expose the clay beneath. The clay was then baked to make bricks for construction. By the 1890s the market gardens to the south of the canal had all been replaced by terrace housing (presumably constructed from the materials recovered from the brick fields), and two enormous railway engine sheds occupied the area to the north of the canal where the brick fields had been. The older buildings on the north side of the canal mark the beginning of the Empson Street Industrial Estate. The steel beam protruding towards the canal from the roof of the second building along is the remains of one of two gantries which were part of the steel framed shed built in 1930 by William Lusty and Sons who were furniture manufacturors. The gantries extended to the middle of the canal and supported travelling cranes which were used to unload timber from barges. This shed is the only building on the site to survive a fire started by incendiary bombs in 1940. “The Cut has examples of tall buildings, both historic and contemporary [untrue – the highest historic building is the Spratt’s Factory at 4 stories]. This has established a rhythm of building heights along the canal side [not anywhere near this site] and is an important feature of this waterway’s character. The form of the building takes a fresh look at the inter-relationships between the historical context of the Canal and, likewise, the harsh expanse of the adjacent road. As such, it is not considered appropriate to create a building of this scale as a pastiche [why a building of this scale at all? ], but to set a standard as a marker”. “The straightness and broad width of the canal means that views are long and diminish to a point on the horizon. They are calm and extend into the distance and are interrupted only by bridges. A consistency of heights along the canal contributes to a feeling of tranquility”. The next bridge carries the A12 Blackwall Tunnel Approach Road across the Limehouse Cut. The towpath is floated under the bridge on pontoons. This was the location of the Bromley Lock. In 1888 a report stated that that both the Britannia and Bromley Locks were so full of rubbish, including old pans and kettles (presumably lost by people taking water from the canal – there was no tap water in the home or at work in those days! ), that they weren’t working properly. Soon after, the more westerly gates of Bromley Lock were removed. The remains of one of the gates can still be seen on your right as the floating towpath emerges from under the A12. On the far side of the A12 bridge the Limehouse Cut ends and becomes the River Lea Navigation. To your right are Bow Locks which provide access from the tidal Bow Creek (and the River Thames) to the Lea Navigation. 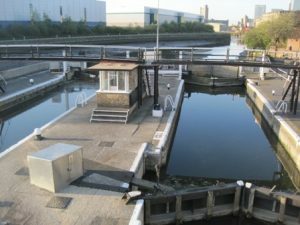 Bow Locks were originally semi-tidal – during high spring tides water would flow over the top of the locks and raise the level of the Limehouse Cut and the southern part of the Lee Navigation. In 2000 a flood wall and an extra pair of flood gates were added stabilising the water level in the Limehouse Cut. From Bow Locks cross the pedestrian bridge to the isthmus between Bow Creek and the Lea Navigation. The horizontal bands on the path over the bridge are to allow the horses that towed the barges to cross without slipping. Walk north between the two waterways and you will come to Three Mills with its old tidal mills and pool. You can get to Bromley by Bow tube station from here by walking past the supermarket and crossing under the A12 by a pedestrian underpass. 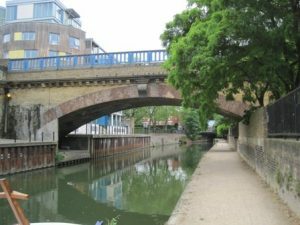 A walk along the Limehouse Cut can be extended to a 9 kilometre circular walk by including a section of the Lea Navigation, the Hertford Union Canal and the Regent’s Canal – see the Limehouse Basin page for a description. Another walk which can be reached from the Three Mills end of the Limehouse Cut is the Greenway. This is an elevated but secluded footpath and cycleway from Bow to the area of the Royal Docks at Beckton to the east.